Do you use Hunsbury Hill Country Park? If so what do you think? Feel free to either leave a user review between 1-5 stars or leave a comment at the end of this post. Hunsbury Hill Country Park is somewhere I’ve visited only twice. Despite this I really think it’s one of my favourite dog walking locations in Northampton, along with Bradlaugh Fields. In this article I will give more detail about the location and try to explain why I think it rates so highly. Hunsbury Hill Country Park is located to the south west of Northampton town centre. It’s an 80 acre site with a nature reserve and picnic areas. The first good thing to note is that there is free parking! The car park I use is located next to the Hunsbury Hill Country Park cafe. 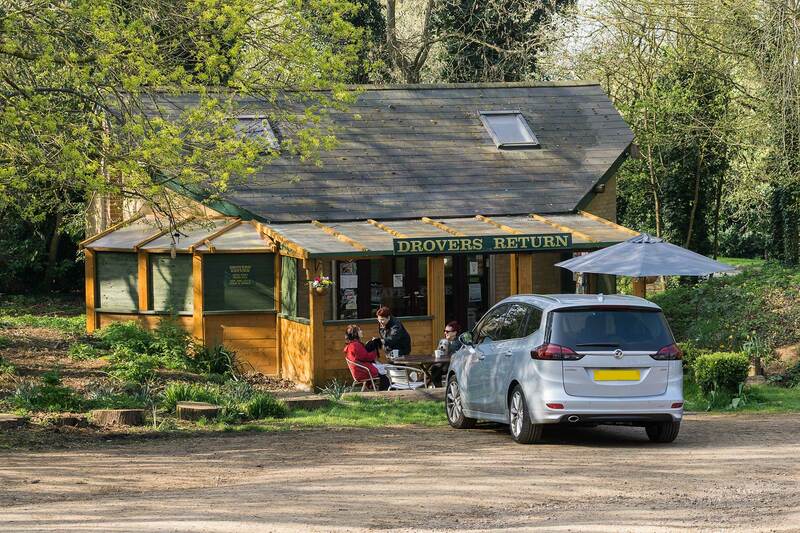 This cafe is better known as the Drovers Return Cafe Hunsbury. It deserves a mention in its own right. The cafe is open from 09:00am until 5:00pm every day with a decent menu, including hot snacks, cold snacks, cakes and drinks. Coffee snobs probably won’t like the fact that it’s instant coffee. However prices are reasonable and their cooked breakfasts smell great. They also have a customer notice board outside where I was allowed to attach a postcard advertising my dog walking business. The image at the top of this post is the cafe. Apparently it was once a toilet but don’t let that put you off, it’s really worth a visit! Once you leave the car park there are a number of nooks and crannies to explore. Much of it is based on an old Iron Age Hill Fort dating from between the 7th and 4th centuries BC. There is good tree coverage that opens out from time to time to fields. Dogs will love the variety here. It’s an ideal location for dog walking whether you are looking to be out just 45 minutes or a couple of hours. There is a figure of 8 walk you can do that takes in both Hunsbury Hill Country Park and nearby Ladybridge Park. I’ve not visited in the depths of winter but the main paths seem to drain really well. I will return next winter and update this post but I’m optimistic this will make a good year round dog walking venue. Another plus was that I spotted a good number of dog waste bins. These seem evenly spaces around the park so you should not have to carry dog mess too long! As you will know if you read my other dog walk reviews, dog waste bins can often be a luxury! It seems popular with dog owners and in my experience both the owners and dogs you meet here are great. As such it could be a decent venue if you are trying to socialise your puppy. Regular visitors to Hunsbury Hill Country Park may have come across The Hunsbury Hill Railway. The 1.5 mile line runs through the park with rides available on the 2nd and 4th Sundays of the month. It’s mainly dedicated to freight railways with some steep gradients and sharp turns. There is a lot to like about Hunsbury Hill and I fully expect it to become a regular venue of mine. There really isn’t anything that I can think of that needs improvement. Maybe it’s one of your regular dog walking venues? If so please leave a comment, I’d be interested to hear your thoughts.